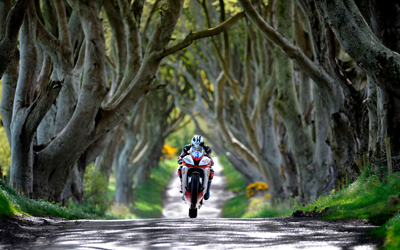 This incredible photograph shows Michael Dunlop preparing for the 2009 North West 200, at the infamous Dark Hedges near Stranocum, County Antrim. As always with Stephen Davison’s work, the picture not only shows a racer at work, but creates an iconic image which embodies the speed, passion and drama of road racing. This is ‘between-the-hedges’ racing in the truest sense, and a particularly poignant image as it was just one year earlier that Michael lost his dad – racing legend Robert Dunlop – in a crash at the North West 200. Michael’s ride to victory in the 250cc race at the 2008 meeting, just days after Robert’s fatal crash, was an emotionally-charged moment for the youngster, but a moment which demonstrated the determination it takes to win. This determination is wonderfully shown in this photograph, showing Michael working hard to get in every minute of practice before taking on the Triangle again. Each canvas has been printed to the highest quality using the latest technology, with archival grade canvas and inks.